Monique says: My niece will enjoy the Storyland DVD. 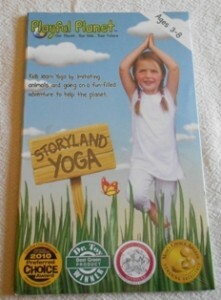 Storyland Yoga is a children’s DVD that teaches yoga poses through storytelling. The instructor leads parents and children through two stories about endangered species and green living while practicing various yoga poses. The Skinies Nursing Cami is designed to facilitate breastfeeding no matter what cup size you have. It is an undershirt that can be worn over or under a nursing bra for comfort and discreet nursing in public. The Art of Roughhousing defends horseplay against those who deem it to be unsafe or wild. 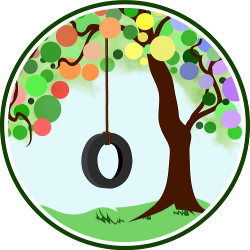 The book makes it possible to become closer to your children through roughhousing, help them develop their intelligence and social skills and maintain good physical health. Like The Art of Roughhousing on Facebook. Follow Anthony DeBenedet on Twitter. Follow The Art of Roughhousing blog. Whip It Out: Songs for Breastfeeding by Moorea Malatt is a collection of original lullabies and comedic songs meant to soothe and relax moms and babies and entertain any older siblings who are listening. It’s breastfeeding-friendly and hilarious, to boot! You can purchase a copy of the Whip It Out: Songs for Breastfeeding CD from CD Baby, where you can purchase MP3s, too! Normally, the CD retails for $12.97, but through December 5, Moorea is discounting the price to only $10.97, so don’t miss out on this great deal! Like Whip It Out Songs on Facebook.